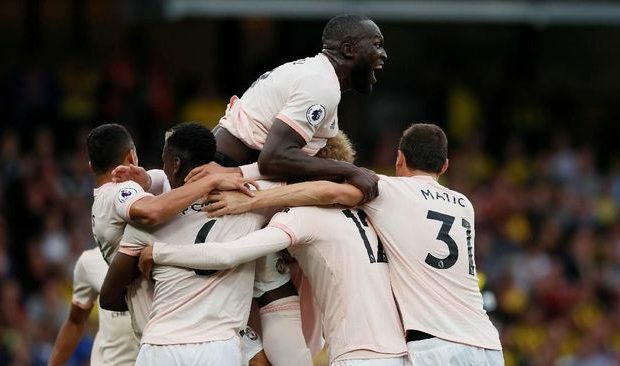 Manchester United won 2-1 over Watford at the Vicarage Road Stadium on Saturday (16/9) in the Premier League season 2018/2019. Man United could threaten through striker Romelu Lukaku in the first minute, but could be anticipated well by goalkeeper Ben Foster. Watford responded to the visitors’ attack with a shot from Abdoulaye Doucoure in the fourth minute, but not yet on target. The long-awaited goal of the Red Devils supporters arrived in the 35th minute. Starting from Ashley Young’s cross from the left side, Romelu Lukaku scored a unique goal using his stomach. Superiority makes the visitors more aggressive in attacking. Pogba’s strike in the 37th minute could be ignored by Foster. Man United added a 2-0 lead through Chris Smalling in the 38th minute. Smalling scored with a volley from Marouane Fellaini’s pass. In injury time, Paul Pogba again had a golden opportunity to score. It’s just that Foster still remains swift to thwart the opportunity of the French midfielder. Although behind 0-2, but Watford still aggressively launched an attack on Man United’s defense in the second round. Watford winger Roberto Pereyra has given threats to the Red Devils several times. Waftord was finally able to minimize the position in the 65th minute through Andre Gray’s powerful strike using Abdoulaye Doucoure’s pass from the left. The intensity of Man United’s attack in the second half seemed to decline and was not as aggressive as in the first round. Man United’s defense line is easily penetrated by Watford players. That was evident from the number of crosses or hulls from the Watford players aimed directly at the penalty box or in front of Man United’s goal. In the 78th minute a neat collaboration between Anthony Martial and Romelu Lukaku gave rise to a golden opportunity for the visitors. But unfortunately, the ball which Lukaku then passed on to Alexis Sanchez failed to end because of the clean-up of Watford defender. Only, Man United’s advantage was slightly tarnished by his red card Nemanja Matic after receiving a second yellow card in the 90th minute. Man United’s victory that was in sight almost disappeared if Christian Kabasele’s header was not denied by David de Gea. But the 2-1 score lasted until the match was over. Manchester United manager Jose Mourinho praised goalkeeper David de Gea’s appearance and striker Romelu Lukaku after his team beat Watford 2-1. Mourinho also gave praise to Lukaku who not only scored goals, but also could contribute in defense. “I think Romelu Lukaku’s last tackle as right-back shows everything. He is a picture of this team, the team that played very well in a long period in the first half,” Mourinho was quoted as saying by Express. One factor in Man United’s victory over Watford was last season’s experience. In the 2017/2018 season the Red Devils also won 4-2. At that time Man United appeared unyielding and more confident when the game began. Besides Lukaku, the Portuguese manager also praised David de Gea’s performance under the goalpost. According to Soccerway’s records, De Gea carried out four important rescue of five shots. One of De Gea’s saves was when he beat Christian Kabasele’s header in the 90th minute. The rescue which finally made Man United win 2-1 and grabbed three points from home. “That is the reason why De Gea is the best, why is he a Man United goalkeeper. When you become a great team goalkeeper, even if you don’t touch the ball in a match, you must determine,” Mourinho said. In Mourinho’s eyes the three points won over Watford are very important for his team to compete with rivals, especially Tottenham Hotspur and Arsenal. Currently Man United has the same number of points as the two clubs. Not only that, the victory over Watford made the distance with the top of the Premier League standings, Chelsea, still six points. “If we don’t win this match, of course the distance is a little further,” Mourinho said.